I remember visiting Northern Ireland in the days when the military occupied the border equipped with machine guns and combat gear. I loved the north just as much then as I do now that the army, barbed wire and weapons are gone and a quiet peace has settled over the land. It’s a rugged, raw and ancient landscape that isn’t changed by external forces. Battles come and battle go, but the land and its sacred places remain unmoved and unchanged. The North is my favorite region probably because the bones of the old landscape still peek through the sod without having to fight massive motorways and residential developments for attention. The ancients knew the energy was powerful here, and they marked many of their sacred places. While some markings have fallen away, the energy still lives. It continues to nourish the human spirit today just as it has for thousands of years. Sadly, most tourists in the north pass by these special places not realizing that just off the road they’re driving on are stopping places where the traveler can walk in two worlds at once. Here are seven of my favorites in the North. You can’t approach this thin places and not be moved. I’m an earth energy novice. Like most common people, I can tell when a place has a sacred feel, but I can’t feel the energy move through the stones and emanate from earth the way some of my friends can. But Beaghmore radiates energy that even I can feel. It’s palpable. 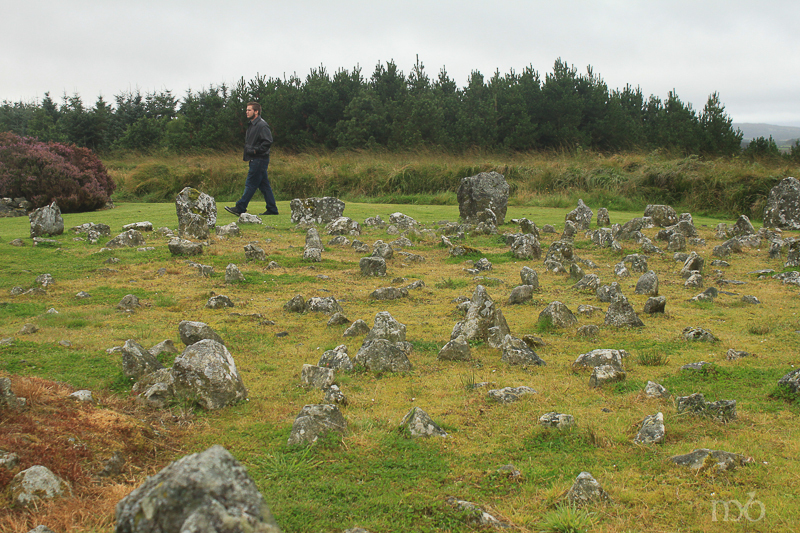 Beaghmore is a series of seven stone circles set in a clearing at the edge of the Sperrin Mountains in County Tyrone. Six of of the circles are paired and one stands alone. The circles date back to 2000 BC. Artifacts excavated from the site suggest ritual activity 1000 years before that. 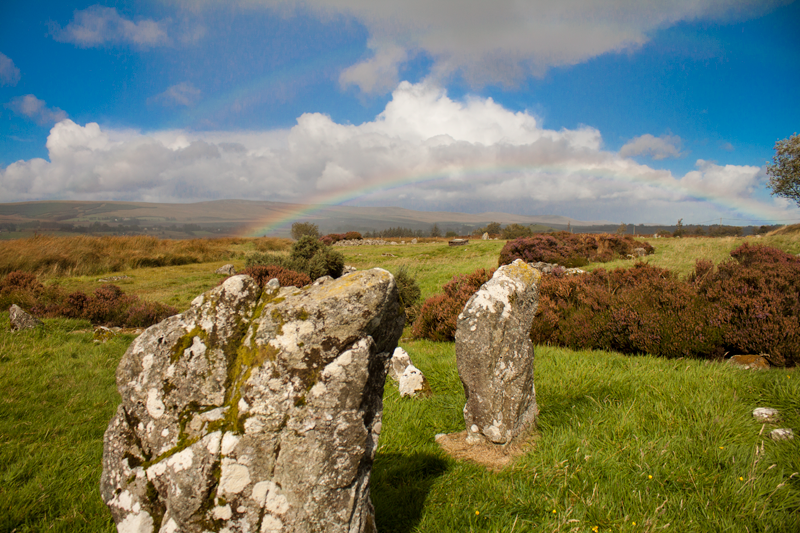 Two interesting things about Beaghmore – The circle that stands alone has 800 jagged stones set in the center (known as Dragon’s Teeth) and one circle has a portal to the Otherworld. In the center of the circle with the portal is a recent burn mark in the center of scorched grass and earth. It is currently being used as a ritual site. 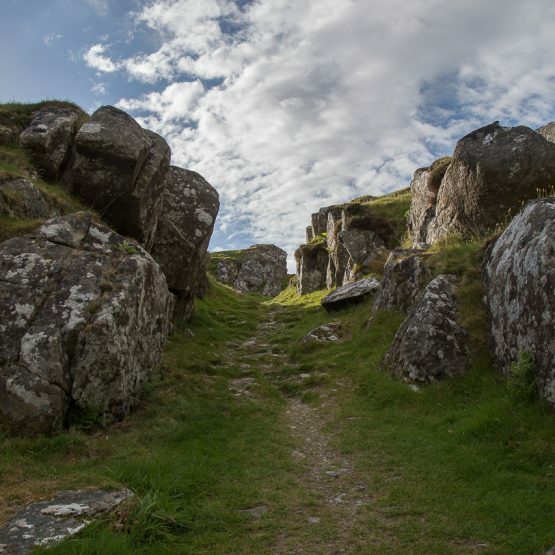 Read more about the mystical nature of Beaghmore on Maura Brooks’ blog. Belfast gets a ton of visitors. But how many know that just outside the city is henge monument that predates the pyramids of Egypt? A henge monument is a circular enclosure with a ditch carved out inside the ring. A henge fort is the same circular enclosure on the ditch is on the outside making it easier to defend the fort. The Giant’s ring is a henge monument with the ring and ditch easily identified. The earth ring is about 600 feet in diameter and in the center is a slight hill crowned by a five large stones that support a large capstone. It’s believed that these stones on the hill are what remains of a neolithic passage tomb. The area is now preserved and used as a park. 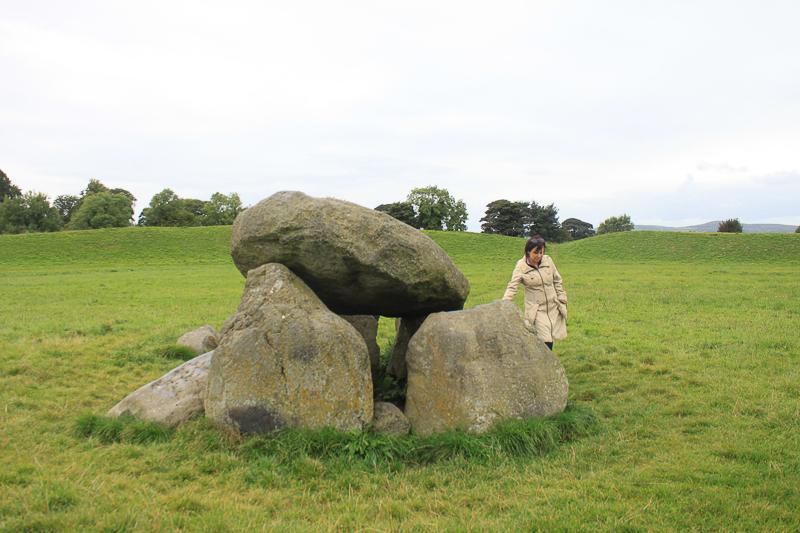 The visitor can do a ritual walk around the ring and then examine the stones in the center. There is actually a 3 mile defined walk of the ring and surrounds that includes a bridge that dates back to the Stone Age and a historic woodland. There is a lovely energy here. I knew about Navan Fort being the legendary stronghold for the Knights of the Red Branch and the place where the goddess Macha died giving birth to her twins. Also known as “Eamhain Mhacha” or the “twins of Macha,” Navan Fort was associated with pagan ritual for years. 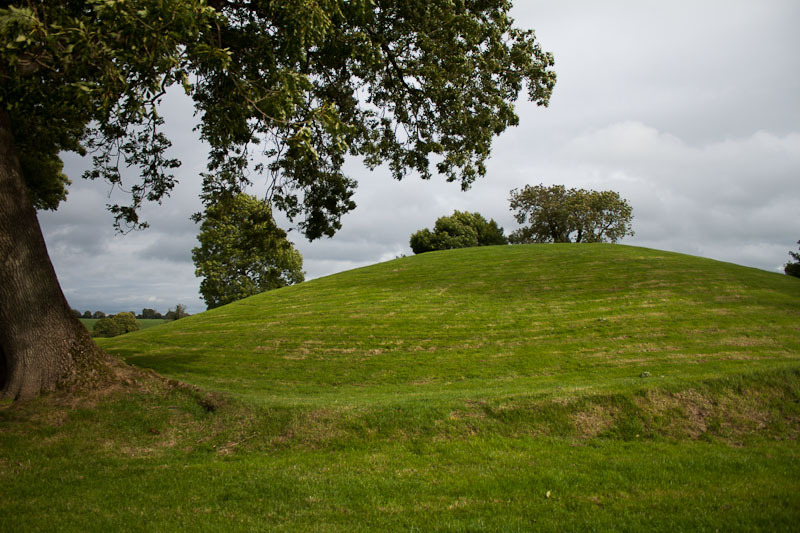 But what I didn’t know was that the famous mound (130 feet in diameter and about 20 feet high) had a fire ritual history. About 94 BC a wood temple supported by large oak pillars was built where the mound is and burned on the site in ritual fashion. The ruins of the temple were covered up with stone and earth creating the mound we see today. Excavation showed that soil used in the covering of the temple came from other places – some quite distant. Today people return to soak in the energy of the mound which apparently is still quite active. There is also a tradition of rolling down the mound to in order to soak in the energy of the mound whilst giving one’s own energy back to the mound. 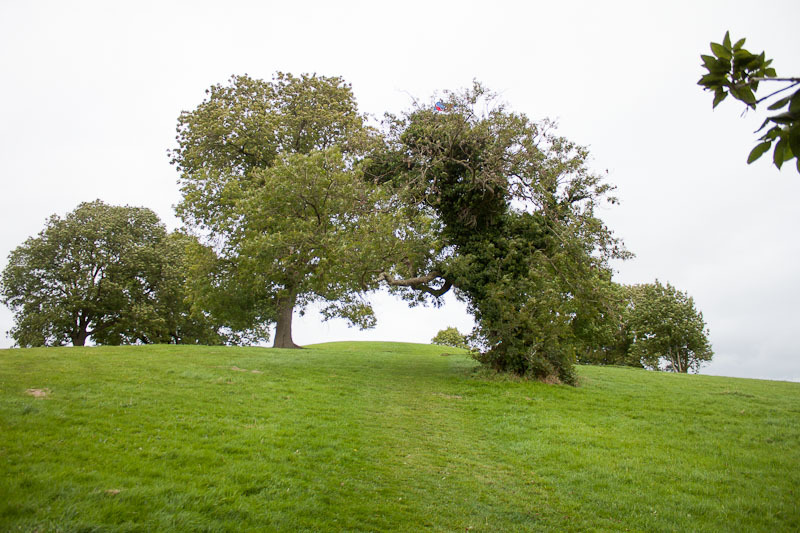 At the base of the mound is a fairy tree, an old oak that looks much like a dragon rearing up against an enemy. The story of Navan Fort is well told during the guided tour. For the full experience, pay the money at the Visitor’s Center and take the tour. The guides are fabulous and there is much to learn from them. 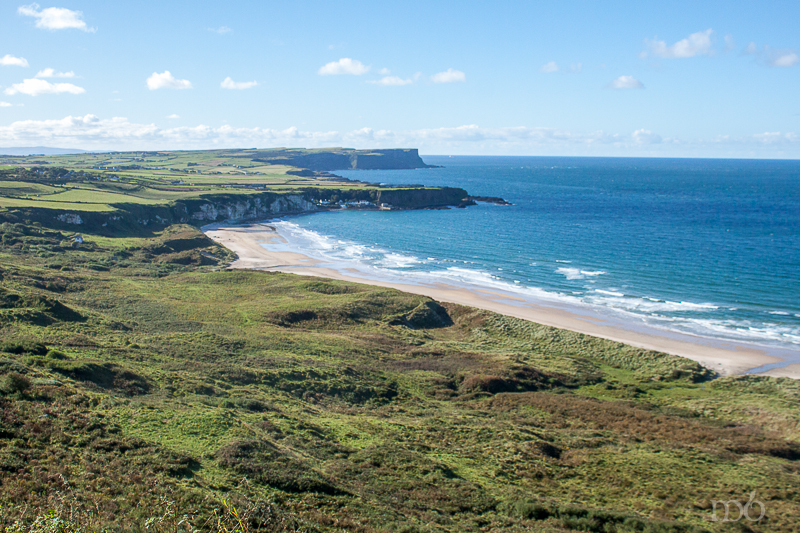 Everyone knows about the great tourist sites on the Antrim Coast – the Giant’s Causeway, Dunluce Castle, Carrick-a-Rede Rope Bridge and the Bushmills Distillery. Travelers visiting these places pass right by Whitepark Bay not realizing what a mystical site they’re overlooking. Right between the Causeway and Rope Bridge, just off the A2 is Whitepark Bay. It has a car park and solid stairway that descends to the magical beach where the sand sings. The sand on the beach is mixed with chalk from the cliff face which gives it such a fine consistency that when the wind blows a certain way (which it inevitably will) one can hear the sand “hum” with vibration. The cliffs are gorgeous and tucked into their vegetation overgrowth are the remains of passage tombs. This space in the landscape was considered sacred to the ancients. This beach is a thin place. It’s a portal, a threshold to the Otherworld. A place for thinking, for connection with your higher self. One only has to walk it to know this truth. 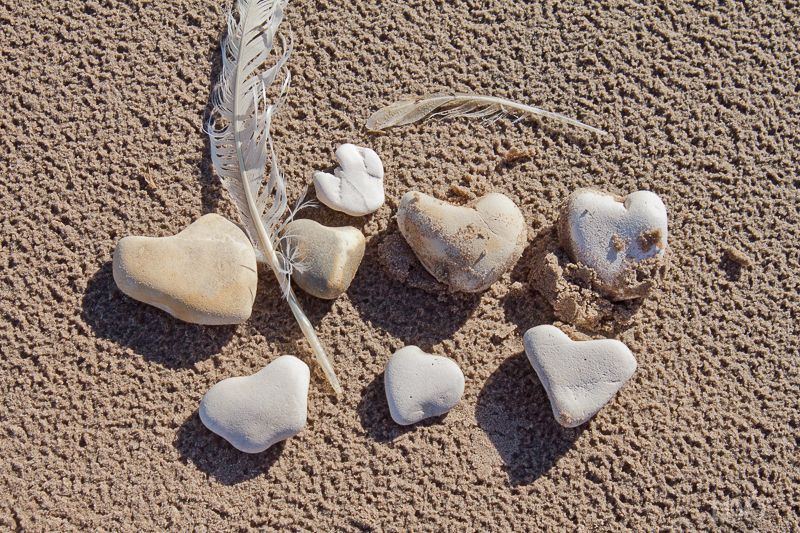 I collect heart shaped rocks when I travel as souvenirs from my twin granddaughters. This usually takes an hour or more to find the perfect rock shaped like a heart. At Whitepark I set out looking for two heart shaped rocks and asked my friend Maura to help thinking we could save time. Suddenly they were everywhere. Within 10 minutes we found 8. 8 … a mystical number for sure. The number that symbolizes infinity, connection to the Creator, the Cosmic Christ, the totality of the Universe. Maura kept one for herself. I brought 7 home. On sits on my desk. A daily reminder of Whitepark Bay. Driving the circle around the Inishowen Peninsula is at least a half-day, if not whole day commitment. But why not commit? It is some of the most spectacular driving in all of Ireland. And unlike many of the other spectacular drives (Ring of Kerry, Sally Gap, Connemara Hills, Molls Gap) it isn’t so crowded with visitors and coaches. Even in the cold and the pouring rain, the Inishowen is gorgeous. 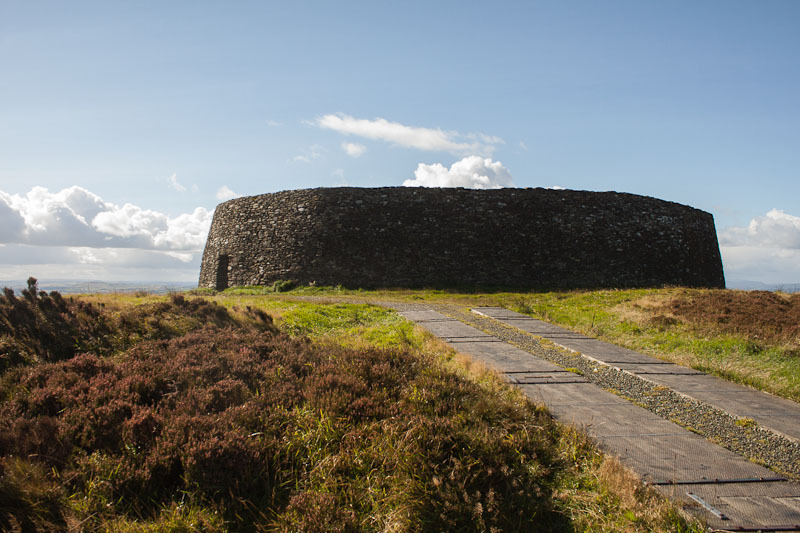 At its base on the south eastern side is Grianán of Aileach, also known as the Sun Palace. Grianán of Aileach was the ancient royal site for northern Ui Néil from the 5th to the 12th century. The now restored cashel dates to the 3rd century and caps three concentric earth rings. 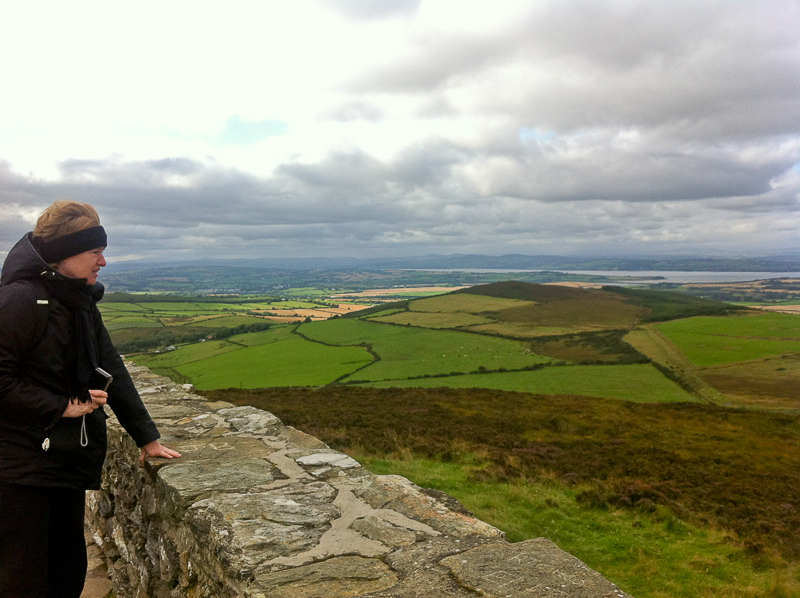 The panoramic views from the cashel of the peninsula, Loughs Foil and Swilly and the city of Derry are dizzying – especially if you’re balancing yourself on the top ridge of the cashel. There is also a tradition that the temple was built by Daghdha, the good god or god of the earth. He was known as the King of the Tuatha dé Danann, a race of supernatural beings descended from the Goddess Danu. They inhabited Ireland before the Celts. This tradition has Daghda building the fort to protect the grave of his son. A variation tells of giants building the hill and the Grianán on top a residence for the shining ones who gave birth to the children of the sídhe. All of these traditions link the hill and the fort on top with supernatural beings, to unseen energy and power and a link to the Otherworld. This is place every mystic should visit before he or she dies. Walking into Caldragh is like passing into another world. 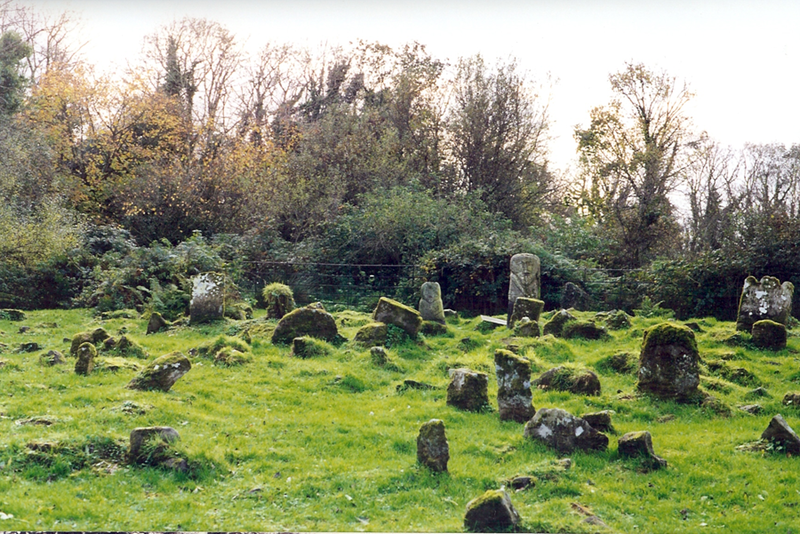 It’s an ancient cemetery on Boa Island set on the north shore of Lough Erne. It is surrounded by hazel woods with a fairy tree at the entrance. The ground is lumpy due to all the old graves, marked with jagged stones now covered by grass. There are also new graves but no church indicating this particular spot is still a place of sacred reverence for the local community. Caldragh Cemetery is most famous for its Janus figure, a stone figure likely dating to the 4th or 5th century that has a face carved on both sides (thus the name Janus who was the Roman god of two faces). The Janus stands about 4 feet high and many archaeologists and mystics have guessed at what the two-faced figure represents, but it’s all speculation. There is a great energy in the stone. 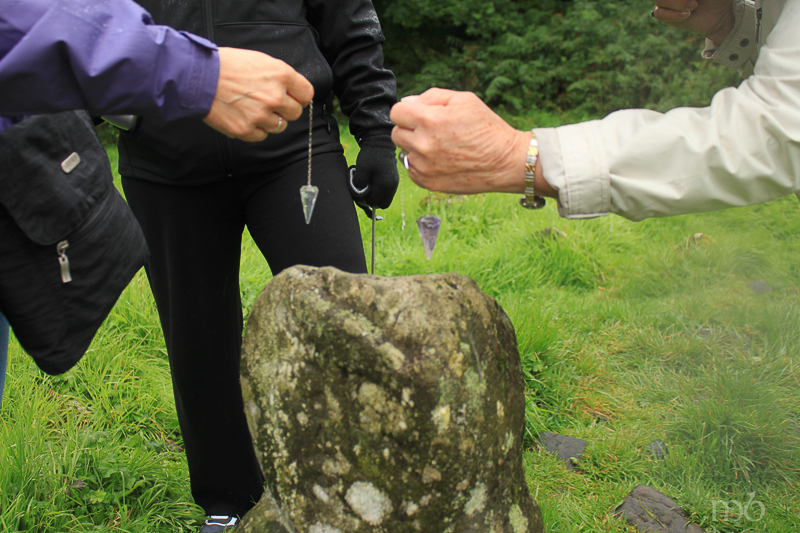 A dangling a pendulum above this stone spins quickly, even for the beginner. And the quiet soul will find a peaceful rest and easy connection to the Otherworld here. Poet and Northern Ireland native, Seamus Heaney memorialized the Janus figure in a poem. For me Caldragh is much like the Rock of Cashel. No matter how many times I visit, I always want to return. 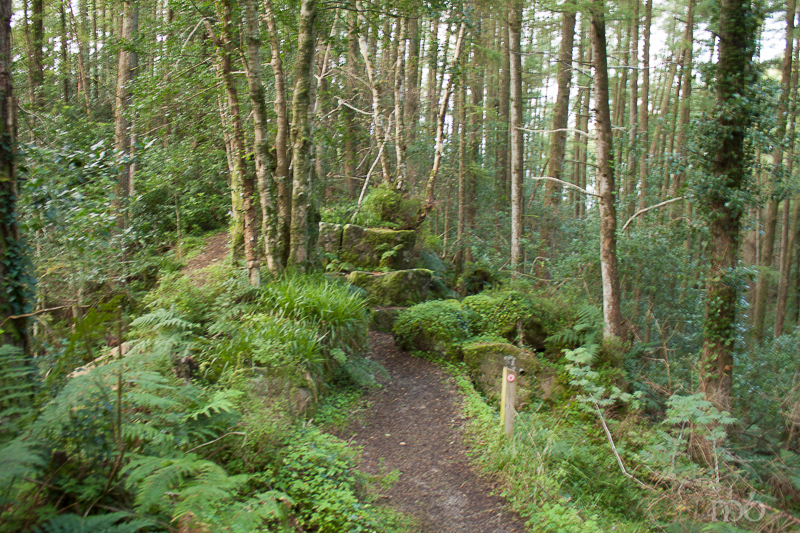 Altadaven Wood or Favour Royal Forest is an old wooded area bisected by an ancient road known as the Sliabh Beagh Way which snaked through Counties Tyrone, Fermanagh and Monaghan. On that road is the Demon Cliff where there is a large stone throne-like chair straddling a narrow space on the road. The chair, and the well below it are now known as St. Patrick’s Chair. 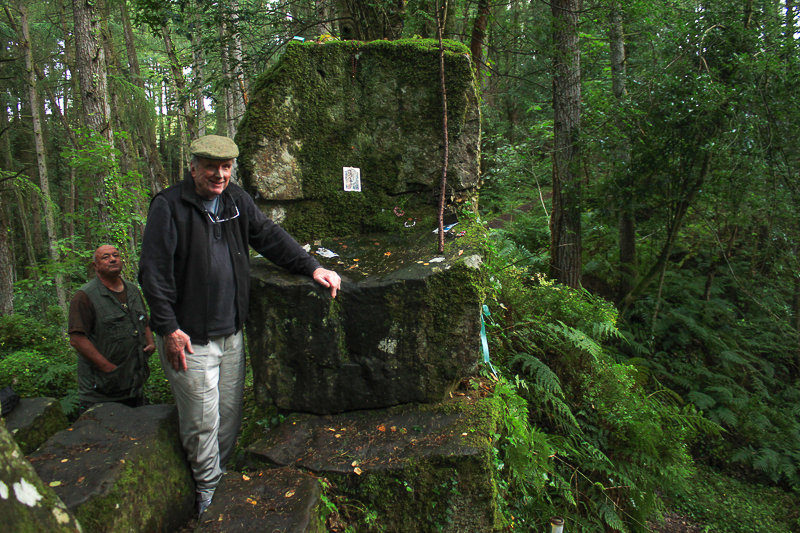 Legends tell of this being an ancient druidic site that St. Patrick came upon while walking the Sliabh Beagh Way. When he saw the pagan ritual being performed he raised his crozier and cast the demons (druids) off the cliff and claimed the sacred site for Christ. The forest is one of those great “edges” in the world where one crosses over into something upon entry. It’s thick and the mystical walk to the chair is deeply shaded by fir trees and lined with ivy, holly and fern. And suddenly you’re at the chair. Tokens left behind are reminders of other pilgrims who walk to the chair with intentions in their hearts. Some say that if you sit in the chair and make a wish, your wish will come true within one year unless you tell someone. It’s worth the walk. All of the sites mentioned above are featured on our DISCOVER THE NORTH mystical tour of Ireland’s thin places.